Mayor Andrew King opened NZMA’s impressive new Hamilton campus in March, saying it represented a show of strength in the city’s economy and was “as important” as Waikato University. 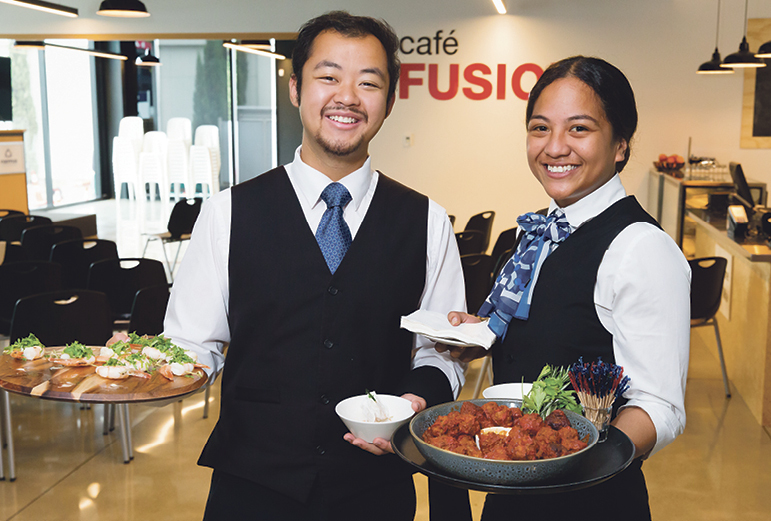 More than 100 attended the March 18 opening of the purpose-built campus on Tristram Street, and they were welcomed by a pōwhiri and speeches before walking through the two-storey building and enjoying food provided by students of the private training establishment (PTE). Describing the campus as a “fantastic facility”, King said the $7 million investment was a “show of strength” in the city’s economy. Referring to NZMA’s trade and skills-based approach, he said those who are better working with their hands rather than following an academic path, can rise to leadership positions and contribute to a positive economy. NZMA students prepared and shared food at the opening. The new campus offers courses from level 2 to level 7, and can train up to 1000 students a year. It currently has 450 students studying programmes in hospitality, cookery, business, retail, contact centre, early childhood education, health, pharmacy and floristry. NZMA general operations manager Derek Martin told guests the organisation has been in Hamilton for more than a decade, and is the largest PTE in Waikato. With 10 campuses nationwide, it is also the largest in New Zealand, with about 4000 students. It is an NZQA-ranked Category 1 provider. “The vision of NZMA is to be a leader in education by making a meaningful difference to the lives of our students and communities,” he said. His sentiments echoed those of earlier speakers at the opening, campus manager Renske van Geffen and students Toby Carr and Rose Te Omeka Kingi-August. Martin described the moment a year ago when he first saw the site that was to become the academy’s new campus. He and chief executive Mark Worsop walked there from their “tired” existing campus on level two of Centreplace. The build saw extensive local involvement, including CBM Architects, Greenstone Group and Foster Construction. With approximately 60 percent of students arriving as beneficiaries, 40 percent with no NCEA, and many who need extra support to make the transition to study and employment, NZMA has built the campus to help attract and retain students. • The site is close to public transport options and bicycle parking has been provided to encourage alternate means of transport to site. NZMA is working closely with Waikato-Tainui to develop programmes and employment pathways through the iwi to jointly identify tertiary education goals and support broader cultural, social and economic aspirations. Waikato-Tainui will provide a cohort of learners and pastoral support, and NZMA will provide the programmes and qualifications. The campus is also set to host an increasing number of international students in a range of programmes. NZMA says recent changes to post-study work visas have made Hamilton an attractive option for international students. Worsop says the aim is to empower students to achieve goals, become role models within their communities and transition to sustainable employment. “We see our campus in Hamilton as being a very important magnet for high priority learners in the community who can be inspired to learn and then find a job,” he says.